TAKE-AWAYS: Participants will augment and solidify the Fundamentals of Management by teaching New Leaders the difference between Leading and Managing, while focusing on business drivers, people development and Change Optimization. Management Tenets include the following: Setting team goals, Planning, Organizing, Controlling, and Motivation. All of our programs underscore Quality and a commitment to Excellence – participants take away an increased sense of Leadership awareness that reduces communication silo’s and closes performance gaps – while enhancing credibility and Emotional Intelligence (EQ). Here, critical tools that drive business outcomes are garnered by applying the “3 Awareness'”® that accentuate communication effectiveness, increasing trust and accountability. From the book, “Creating a Culture of Excellence: The 3 Awareness’s“® – these powerful one-day workshops blend the Fundamentals of Management and our trade-marked Conscious Leadership Principles, through our proven experiential learning models that intrinsically empower individuals to inspire others and focus on key business drivers. 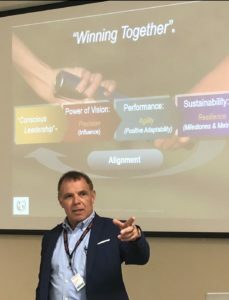 Vision alignment and “Buy-In,” set in, as strategic choices that enhance quality and results, begin to reflect the cultural Purpose that becomes the framework for improved inter-personal relationships and effective team communications. Personal Growth, Change Optimization and authenticity accentuate performance excellence as a natural consequence to raising the bar on personal awareness.